Modern applications have it tough: they need to be delivered to users anywhere, anytime, and on any device. Elaborate application delivery technology stacks have been developed to address these requirements, putting a challenge in front of network, application, and monitoring teams: how can they collaborate and monitor the entire stack to quickly detect suboptimal performance, cyber-attacks or even unplanned outage? If you already use Microsoft System Center Operations Manager (SCOM) as your monitoring tool, your applications and infrastructure health are likely to be already taken care of. However, visibility into your F5 BIG-IP application delivery controllers (ADCs) that sit in front of applications is still missing. Questions like “Are all application servers used in load balancing?”, “Is my application under attack?”, or simply “Do I need a bigger F5 box?” are not easily answered just with SCOM. Comtrade delivers the missing piece to this puzzle with SCOM Management Pack for F5 BIG-IP. With F5 BIG-IP MP, BIG-IPs become first class citizens in SCOM. And SCOM truly becomes your single monitoring console, reflecting health of the entire application delivery stack and enabling network, application, and monitoring teams to effectively collaborate (instead of stepping on each other’s toes). HYCU Data Protection für Nutanix bietet einen neuen Ansatz zum Schutz Ihrer hyperkonvergenten Infrastruktur. HYCU ist die einzige Backup & Recovery Lösung für Nutanix, die sowohl für die automatische Erkennung von Anwendungen und virtuellen Maschinen innerhalb eines Clusters sowie hypervisorunabhängigen Schutz für AHV und ESX in Nutanix- und Nicht-Nutanix-Umgebungen optimiert ist. Sie können die vorhandene Sicherungsinfrastruktur auch als Ziel für Ihre Daten nutzen, indem Sie sie wie Prism verwenden. • Welche neuen Features bringt HYCU mit? • Wie unterscheidet sich HYCU von anderen Backup-Lösungen für Nutanix? • Wie positionieren Sie HYCU in Projekten? Xavier Stern, Territory Director Southern Europe, HYCU, Inc.
HYCU es la única solución de respaldo y seguridad dedicada a NUTANIX (AHV, ESX), para complementar la protección de datos proporcionada de forma nativa por NUTANIX. Certificado en AHV (HYCU se desarrolla en primer lugar en Acrópolis) ESX, Nutanix Files, Volume Groups, y CALM . HYCU, socio tecnológico estratégico de Nutanix. Nutanix utiliza la solución de HYCU para sus copias de seguridad. Hycu est une solution de sauvegarde dédiée NUTANIX ( AHV, ESX), permettant de venir en complément de la Data protection délivrée en natif par NUTANIX. Certifiée AHV ( HYCU développe en premier sur Acropolis) et ESX , Nutanix Files, Volume Groupes, CALM…. Hycu, Strategic Technology Partner Nutanix. Paul Nashawaty, Chief Evangelist | Global Product Marketing Leader HYCU, Inc.
Paul Nashawaty, Chief Evangelist | Global Product Marketing Leader, HYCU, Inc.
Modernized data centers are encapsulating operating systems and applications into a virtual machine (VM). This helps consolidate and simplify IT from what used to be called distributed or legacy systems. The good news is that when bringing legacy three-tiered architecture into a consolidated infrastructure, your business-critical applications are now residing in fewer distributed resources. As a result, protecting those precious resources--in this case, your VMs-- and the application data housed in them, is imperative and must be a top priority for IT. How are you backing up your Virtual Machines (VMs), Applications (Apps) and data running on Google Cloud Platform (GCP)? For starters, you don’t want to write scripts or use legacy backup. They will remove the simplicity of Google Cloud. In this session, you will learn how easy it is to protect your VMs and Apps on GCP with a completely managed Backup as a Service from HYCU. HYCU Data Protection for GCP is a fully-managed solution that has been purpose-built from the ground-up for Google Cloud. Simply define the service level objectives, assign to Application/VM instances and HYCU Data Protection for Google Cloud Platform will take care of the rest. Paul Nashawaty Chief Evangelist | Global Product Marketing Leader HYCU, Inc.
Business uptime is the focus for most IT organizations. The promise of a simplified approach to offer protecting often is compromised with the complexities of redundant functionality and features that get in the way of protecting your assets. With Nutanix hyper-converged infrastructures, data protection just became easy. This sets the foundation for future advancements in the offering as well as keeps business protected without compromising data sets across the infrastructure. HYCU Datenschutz für Nutanix wurde entwickelt um die Datenschutzkapazitäten von Nutanix zu ergänzen und unnötige Redundanzen zu eliminieren. ergänzt diese mit agentenlosem Anwendungsdatenschutz, Wiederherstellung und Anwendungserkennung. your applications. Shouldn't your backup and recovery solution help too? HYCU data protection for Nutanix was designed to complement Nutanix data protection capabilities and eliminate unnecessary redundancy. It allows customers to leverage key storage specific capabilities, such as snapshots, clones, replicas, compression, and deduplication, to run on Nutanix while complementing it with agentless application data protection, recovery and application discovery features. Many IT teams are learning that legacy data protection solutions lack features needed to protect hyper-converged infrastructures. These solutions treat Nutanix like disk, and don't allow you to intelligently protect VMs and the applications running on them, which leaves protection in the dark, and unsure that you can recover. - HYCU’s application-aware backup and recovery software. - ExaGrid’s hyper-converged secondary storage for backup appliance. - Industry-leading hyperconverged infrastructure from Nutanix. - How to protect your Nutanix with a next-gen purpose-built, application-aware backup solution. - How to create a backup infrastructure that can scale along with your Nutanix. - How to deliver on long-term retention without breaking the bank. - Live Demo of the joint solution. Are you worried about resolution time of your application delivery issues, or looking for a self-service visibility across all components of your F5-based application delivery stack? Solve your challenges with end-to-end application stack monitoring. - What modern application delivery is and why it is important? 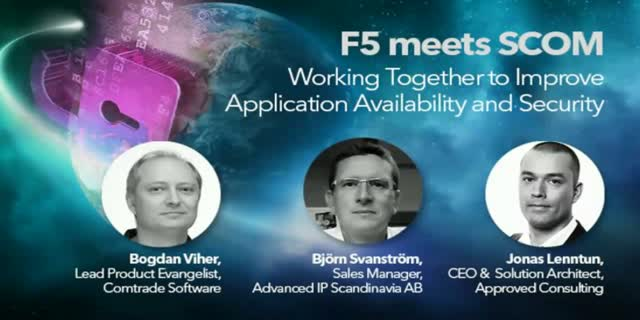 - What challenges are related to the application delivery? - How can you monitor complete application delivery stack and why it matters? Modern trends, such as Internet of Everything (IoE), are rapidly changing the way we work and live, which makes it difficult for traditional datacenters to cope with the pace and adjust to Big Data paradigms – it is time for hyperconverged infrastructure. Hyperconverged infrastructure is changing the way datacenters are deployed by providing highly scalable, performant and easy to manage infrastructure that, unlike traditional 3-tier architectures, efficiently addresses and handles Big Data. Do you ever wonder: How do modern monitoring solutions address these new trends and provide visibility into hyperconverged infrastructure? How do they connect this information with applications running on it? It is all about customers, applications, time, satisfaction and smooth performance – and this makes business challenging. There is constant focus on making sure that the application is not starved for resources so the business can run smoothly. Anything affecting application availability or performance must be dealt quickly or you jeopardize employees’ productivity (internal apps) or even worse, you might lose customers (external apps). In the hyperconverged environment - it is more than just the interaction of the application and the VM resources, it is also how the application is impacting all configured hyperconverged resources. For example, if a queue length is growing, what could be causing the infrastructure to not process the requests in a timely fashion, could there be an excessive IO latency, not enough processing power, not enough SSD resources, or an excessive burst in requests? Currently, IT admins can resolve the applications issues, but it needs to manually correlate application metrics with the infrastructure resources (cluster, storage, replication, etc.) to make sure everything is running smoothly. Learn how Comtrade Software is addressing this by automatically associating metrics between the application and the infrastructure and get quick answers to critical questions. Microsoft workloads, such as Microsoft SQL and Microsoft Exchange, are two of the main business critical workloads running on Nutanix Enterprise Clouds. It is very important to size their resources correctly, otherwise, availability disruptions might occur, which affect QoS and subsequently cause business damage. - Which Microsoft SQL/Exchange platforms are running on Nutanix clusters? - Which virtual machines are hosting Microsoft SQL/Exchange applications? - Are the VMs, hosting Microsoft SQL/Exchange applications, properly sized regarding CPU/Memory/Storage? - Are the MS SQLExchange applications properly replicated for high availability and disaster recovery scenarios? - Does the latency of hosting Nutanix cluster effect Microsoft SQL/Exchange applications running on it? - Does the hosting Nutanix cluster have sufficient resources? - Is the application data hosted on SSD drives? This information is vital for keeping QoS for Microsoft workloads running on Nutanix Enterprise Clouds at their optimal performance. Comtrade's Management Pack for Nutanix provides this information in SCOM which enables IT administrators to combine it with the information provided by application oriented management packs (MPs) – in short, they get the complete overview over the state of Microsoft workloads running on Nutanix Enterprise Clouds. Lightning-fast and impeccable application delivery performance has nowadays became a modern standard in digitalized world, therefore a daily struggle to deal with increasing network loads has been undertaken into a large amount of attention and work to enable consistent flow in the delivery chain. Applications have become the new gold and protecting application delivery is the most important task for your business. Application performance and availability is impacted by a wide variety of factors, therefore Comtrade’s SCOM Management Pack for F5 BIG-IP identifies specific nodes affecting applications and enables complete approach for resolving and maintaining operational functionality. Join us as we take a look under the Nutanix hood to understand how business critical applications like Citrix XenApp and XenDesktop use compute, storage and virtualization resources. While there are many existing solutions to monitor individual applications, what’s missing is a solution that links the applications layer with the underlying infrastructure to provide a single view of all the layers that impact the performance of business critical applications. Comtrade natively plugs into Microsoft System Center Operations Manager (SCOM) to monitor Nutanix infrastructure that is hosting business critical applications, and can automatically connect applications – including Citrix XenApp/XenDesktop – with virtual machines hosting applications that run on Nutanix. Essentially, Comtrade connects application and infrastructure layers together, enabling quick business critical application discovery and remediation, and ensuring optimal performance that is neatly visualized in one consolidated dashboard. Hyper-converged is all about keeping it simple. Your monitoring and data protection should be, too. HYCU, Inc. empowers IT, system and Nutanix admins to take back the datacenter without breaking a sweat. Our application-focused solutions give you full stack visibility, to see beyond VMs into business-critical applications. We break through barriers so IT can quickly eliminate problems, fully and reliably recover applications and data, and deploy our products before their coffee goes cold. There’s no waiting, no learning and no hassle. HYCU harnesses 25 years of sophisticated IT outsourcing, insights from over one million users, and work experience with more than 25,000 customers, more than 10 ISVs and 350 employees to create a deep and unrivalled well of industry expertise. The result is unsurpassed build alignment with industry leaders and a formidable competitive advantage in the HCI space.